After all of the Christmas decor was put away, I was having a tough time deciding what to keep on the dining room table. I think day to day centerpieces can be hard. Seasonal centerpieces are easy, but I'm always looking for inspiration for all of the in-between holidays time. A while back I asked my Instagram friends to share ideas they had posted, and they had some great ones! Some are simple, some elaborate, but all beautiful in their own right. Since then, I've been playing around a little bit with ideas. Once I got started, I surprised myself with all of the options I came up with! Hopefully, you might have similar pieces from one of these looks that you might want to try in your home too. I love this large-frond fern and just dropped the bucket inside the blue and white piece. I picked this pair up at Ross this week. It's my favorite place to find blue and white pieces at super prices. We went to a fancy event this week and these gorgeous flowers were the centerpieces. I'll enjoy them for a while! 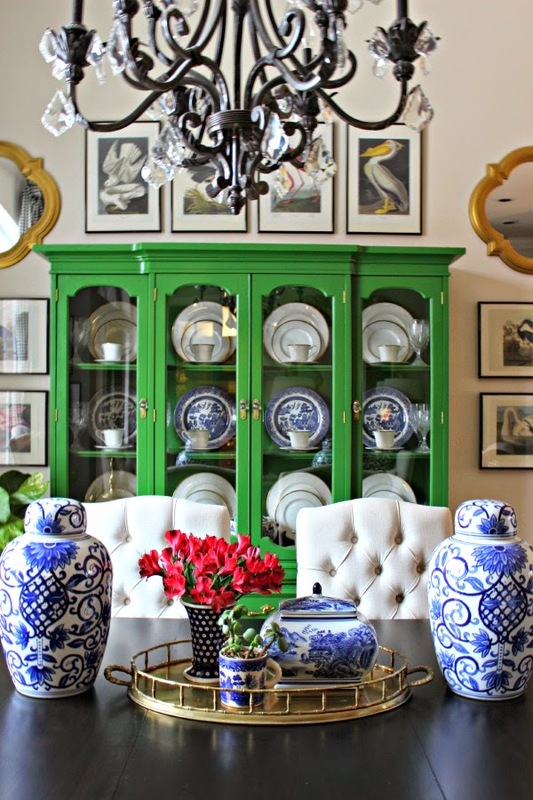 If you have a collection of favorite pieces, group them all together on a tray to display. A few touches of greenery help bring in some life. Another mix with favorite collectibles. Natural items such as dough bowls, wooden carved bowls (filled with fruit is always nice), or something like these stick balls work well grouped together. Flowers add a nice pop of color. Once again, pull out what you might collect and group it together! These are pretty all on their own, even with nothing in any of the containers, but some flowers, greenery, or branches added in would certainly work also. This one is my favorite for now, but when the flowers fade I'll go back to one of the other choices. 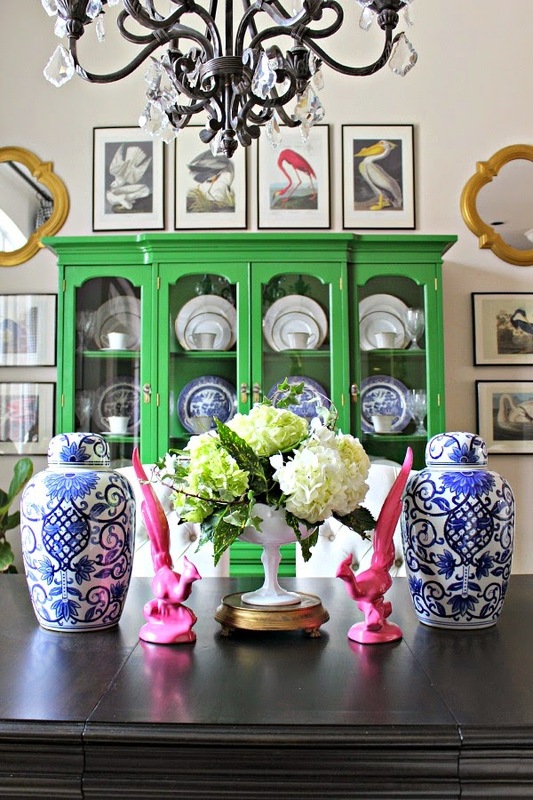 (Remember the pink birds from the antique store I showed you a few weeks ago? I loved the pink but gave them a brighter shade (for now). So, I'm dying to know. 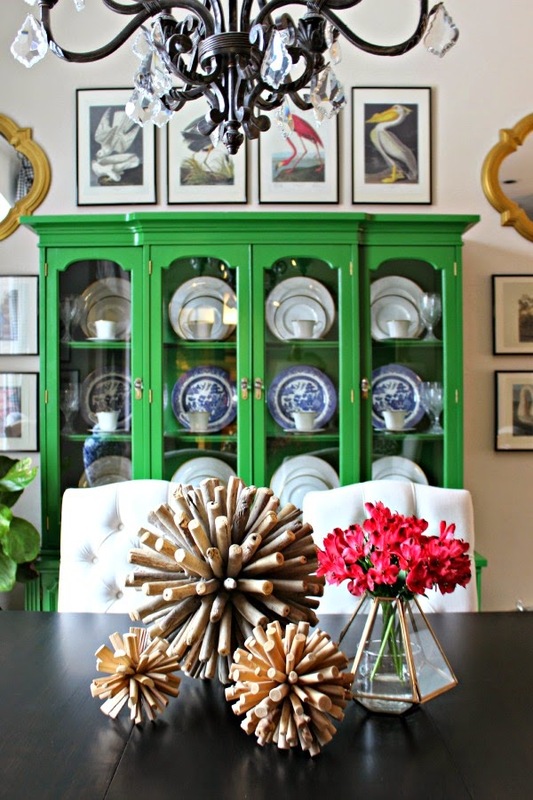 What's your go-to every day Dining Room table decor? I love all the different combinations you used:). I definitely use a lot of fresh flowers that I change out seasonally. Maple leaves in the fall , geraniums in the summer, forsythia and tulips in the spring and candles and evergreens in winter. With four kids and a puppy my dining table is the one place in my home that I can put up a display that will stay put without getting knocked over:). love all of them! 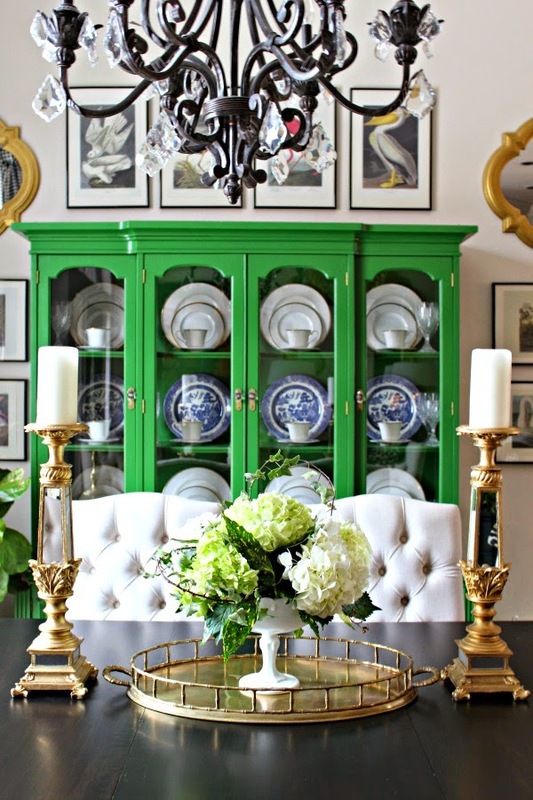 the natural elements are my favorite- i love how they let the emerald in the cabinet to be the color that shines! Oh my, I can't pick a favorite! They all look amazing. 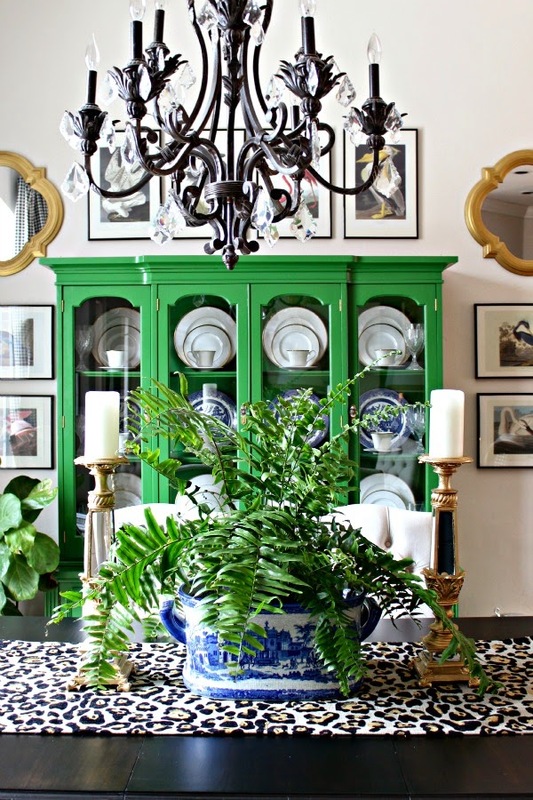 However, I do love the ones with the fern as it draws your eye to your beautiful buffet and hutch. Right now my go to is my clam shell. Thanks for the heads up about Ross. Will need to stop in there. These are all so beautiful. I think my favorite are the ginger jars and the fern. 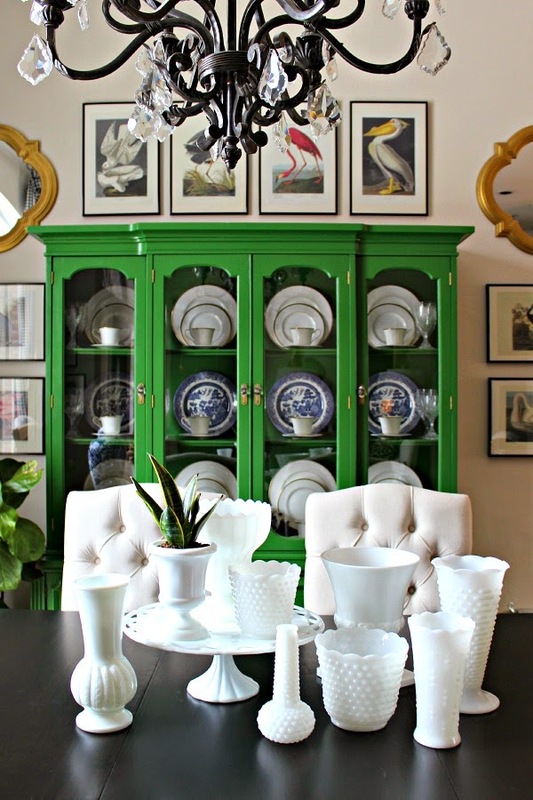 Your dining room is one of my all time favorites, I love your green cabinet and your host chairs. Fabulous. I usually have a runner of some sort and flowers. I need to think outside the box more. Jennifer they're all beautiful...love all your blue and white pottery!! Aaaaaahhhh! thank you so much for including my dining room!!!! I'm so honored!!!! love all your ideas, so hard to pic a fave!!! LOVE them all! But I also like #8 the best...It's posts like this that make me miss not having a formal dining room- yours is such a lovely space! I like the blue and white! I always like my centerpiece on a tray so I can move it when we eat in the dinning room. Love all the examples! First of your selections, #1 and #3 are my favorites. 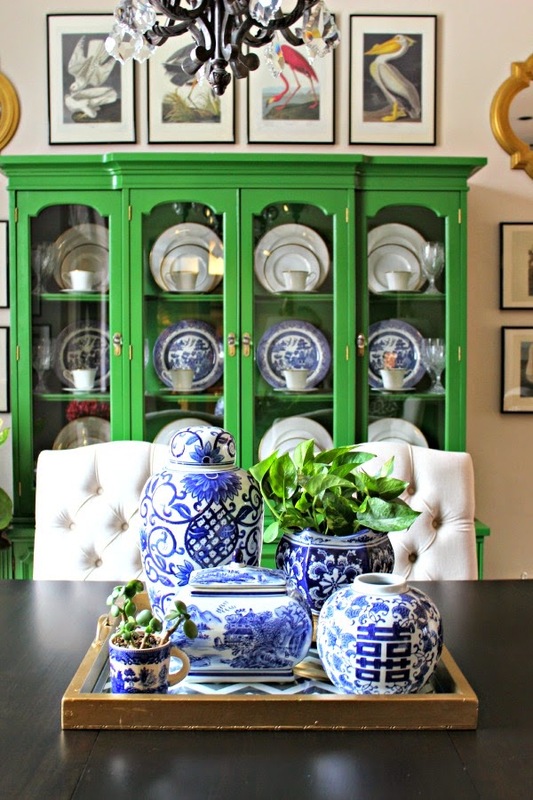 As for me, I keep an antique, white cast iron planter on my formal dining table. I change the contents to meet the seasons or just place greenery in it. Right now it is filled with ivy. On my kitchen table, I have a blue and white footbath that also contains seasonal fresh greenery or flowers. How beautiful! These are all wonderful ideas for table centers and #8 is my favorite. I love all of your blue and white; where do you find most of it? 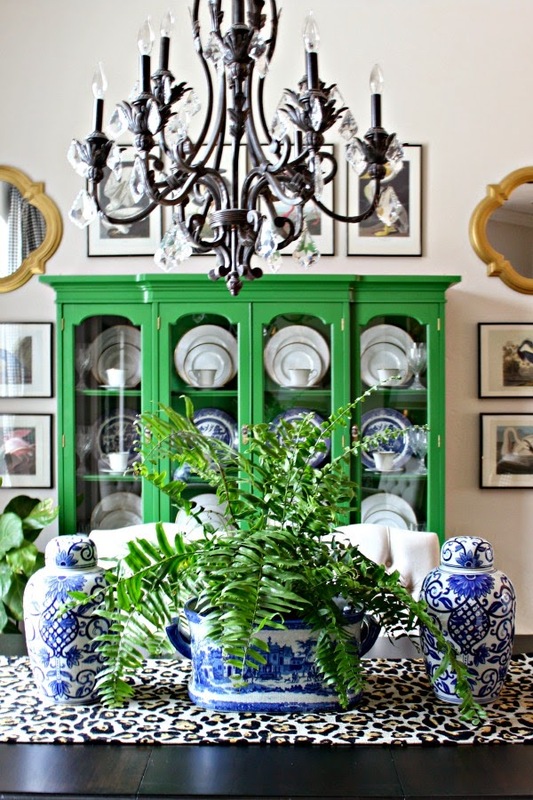 Love your blue and white pieces. I collect those too! maybe add a textured runner to your table...added interest! You have fabulous, glamorous taste! Excited to see the pink birds! Love this post - you are the master of centerpieces! My dining room table is pretty sad right now - I haven't had a centerpiece on it since Christmas - this inspires me to get to work on it! I love every single option! You can do no wrong! Hey Jessica! I find most of it at Ross! Do you have one near you? They've had some good stuff lately for Spring.